This is probably the softest comforter I have ever had. It has been great so far. The only thing is I thought I was getting more of an aqua color and it is baby blue. The stitching seems good and I think it will last a long time. It is makes my bed look like a cloud. The perfect comforter to keep you cozy all year round. The All-Season Down-Alternative Reversible comforter from Merit Linens features the perfect loft and Down-like feel to keep you warm and toasty while you sleep. Designed for healthy living and 100% hypoallergenic for allergy sufferers, this luxury comforter presents a quality alternative to Down with incredible loft and end to end baffle-box construction, preventing fiber from shifting, eliminating the need for regular fluffing. • The shams are zippered with very small, unobtrusive, hidden zippers that are very close to the hem line so that your pillows will seamlessly disappear into your newly color coordinated bedding collection. • 1 Twin/Twin Extra Long Comforter: 70" x 90"
• 1 Full/Queen Comforter: 92" x 92"
• 1 King/California King Comforter: 108" x 94"
Dimensions 90.0 In. X 70.0 In. X 2.0 In. The Merit Linens All-Season Down Alternative Reversible Comforter Set is soft and warm, very well made and comfortable. I purchased the Sage color. Comforter fits my queen size bed perfectly and the matching sage pillow shams complete the set. The comforter reverses to solid white (shams are sage - they do not reverse). Arrives very tightly wrapped in a small package - puffs up when you open it. I'm very pleased with this purchase. Thanks, Overstock. I am addicted to comforters, literally. I have over a hundred easy. This is my first review ever and finding the words to describe a comforter as soft and fluffy as this one may sound silly. This comforter is not soft and warm yet it almost feel weightless. I do not like heavy, bulky and constructing covers that make it hard to move. This is perfect, soft, warm, and to the touch, I would compare it to a rose petal. I purchased the king cal but I am going to order a twin for when I'm watching TV. I love comforters, my husband refers to me as a collector. This is absolutely amazing!! Ive never had such a soft and silky comforter. It's just as it looks in the picture which is very uncommon. What a great deal!! It’s a nice light comforter blanket. Very soft and comfortable but it’s not for cooler nights. It’s a summer weight comforter and that’s with one added velour type blanket. Perfect if you layer blankets. I ordered the cream and white, but cream is more like a pale yellow. I bought queen full and it fits our RV queen sized beds which is full sized queen and not a smaller RV queen, perfectly. It’s very soft and it has nice box stitching and tge light weight will be very easy to wash and dry in an RV resort campground and that makes life easier. As long as you know you must layer it, it’s a good purchase. I bought two twin size of these comforters. The size is very good for a deep twin mattress and it is certainly warm. Color blue is true to picture. The Merit Linens All-Season Down Alternative Reversible Comforter Set arrived in a timely manner. It is good quality and just what we were looking for. This comforter is so light and yet so warm it’s unbelievable! I don’t like blankets weighing me down and this blanket is like sleeping under a cloud! This comforter is light weight, very soft and warm. Fits my king size bed perfectly. This is the first comforter I have found that I want more of. Very happy with it and will be ordering more. Could not beet the price either. This comforter is a great weight ! May also act as a winter blanket under a comforter or alone as the main comforter. Washes well...stuffing stays in place. I bought the off white /light bone color...perfect color,as described. The queen size is true to dimensions. Good buy ! It’s exactly like the picture and it’s one of the fluffiest and warmest comforters I’ve ever owned! Bought this for the guest room for family visiting over the holidays. I loved the color and they couldn't believe how warm it was despite feeling very lightweight. 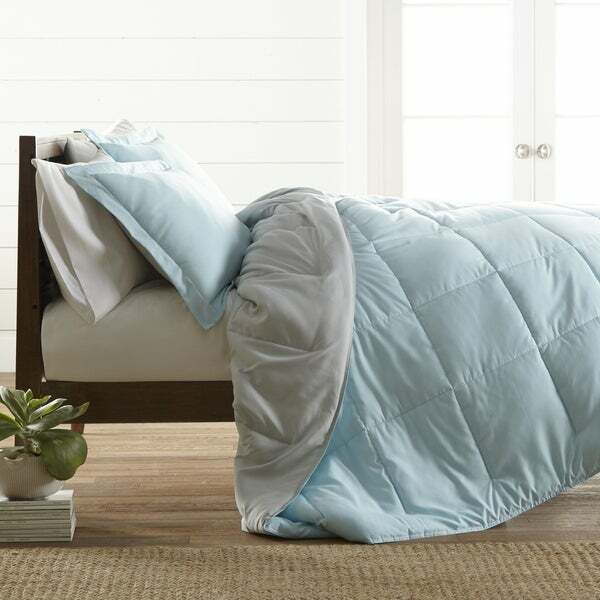 Love the colors and softness of this all-season alternative down comforter. It's true to colors and thick, fluffy, and soft. Would recommend this to family and friends. Its soft and definitely what I was looking for. Love it! I’ll order 2 more different colors! Very comfy! I love this comforter. It's not as thick as I thought it would be but it is very soft and very comfortable. It was well packed and I had it in just a few days. To compliment curtain panels previously purchased at Overstock.